I’m a totally believer after I tried using Greek Yogurt for Muffin. 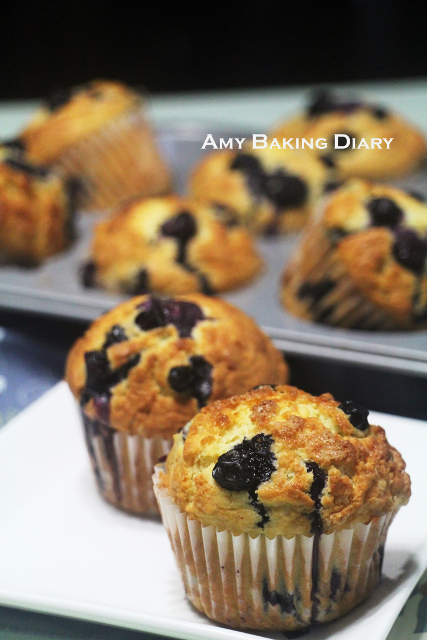 The muffins are so moist and delicious, and it all because of yogurt, I no longer using sour cream or oil to bake muffin. I love muffin because aside from the fact that they are easier to make, they are also easier to eat – Just grab and go! 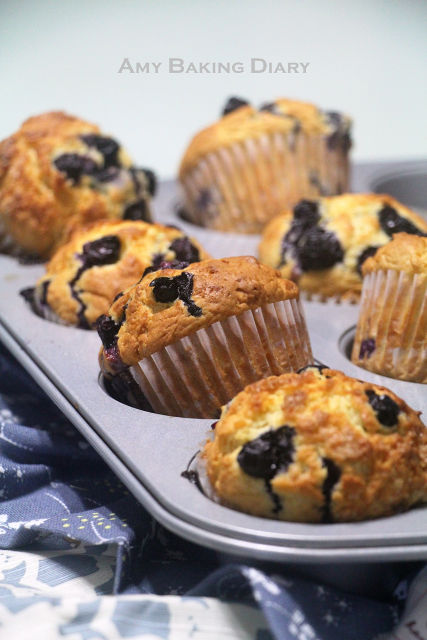 However, by adding this muffin with blueberries, it gives the muffins a great big juicy flavor burst when you bite into them and I like it to be served at breakfast with a cup of long black coffee. Fresh from the oven, the aroma of these muffins are really irresistible. I was told that blueberries goes well with Lemon. I’ll give a try by adding some lemon zest when I bake this again the next time. (1)Adjust the oven rack to the lower middle position and preheat the oven to 200 Deg C.
(2)Line a 12 cup muffin pan with 12 cupcake liners. In a medium bowl, whisk together the flour, baking powder, baking soda and salt. Set aside. (3)In the bowl, beat the butter on medium high speed until creamy and lightened up; 1 to 2 minutes. (4)Add the sugar and beat together until lightened up in both color and texture; 4 to 5 minutes. The color should turn very pale and texture should look fluffy. (5)Add the eggs, one at a time, beating well after each addition. Add in the vanilla and beat together for one minute. 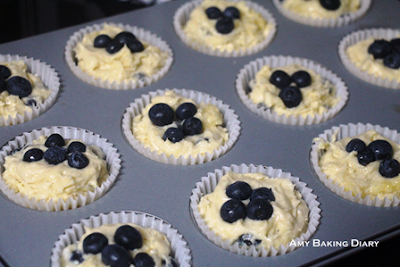 (6)Toss 2-3 tablespoon of flour mixture with only 120g of blueberries. Reserved the remaining blueberries for topping. (7)On lowest speed, add in one-third of the flour mixture and mix until mostly combined. Add in half of the yogurt and lightly stir until almost mixed in. Continue with adding another one-third of the flour mixture, followed by the remaining yogurt and ending with the last third of flour mixture. Mix until just combined. DO NOT OVERMIX or you could end up with tough muffins. (8)Using a rubber spatula, fold in the blueberries, which was toss with flour. For about 3-4 folds. Again, do not overmix. (9)Using an ice cream scoop, divide the batter evenly among the prepared muffin pan, filling the cups almost ¾ full and top with balance blueberries. (10)Bake for 20 to 25 minutes, or until the top are golden brown and spring back to the touch and a toothpick inserted in center comes out clean. (11)Let muffins cool in the pan for about 5 minutes, then transfer to a wire rack and allow to cool slightly before serving. Served warm or at room temperature. Allow to cool completely before storing.